Bunny Berigan (November 2, 1908 – June 2, 1942) was an American jazz trumpeter and bandleader who rose to fame during the swing era, but whose career and influence were shortened by a losing battle with alcoholism that ended with his early death at age 33 from cirrhosis. 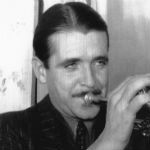 Although he composed some jazz instrumentals such as “Chicken and Waffles” and “Blues”, Berigan was best known for his virtuoso jazz trumpeting. His 1937 classic recording “I Can’t Get Started” was inducted into the Grammy Hall of Fame in 1975. He attended the University of Wisconsin, teaching trumpet and playing in dance bands after school hours before joining the successful Hal Kemp orchestra in 1930. His first recorded trumpet solos came with it, which toured England and a few other European countries later that year. He also appeared as featured soloist with bands fronted by Rudy Vallee, Tommy Dorsey, Abe Lyman, Paul Whiteman and Benny Goodman.